Synopsis: I am everything no longer forgotten.I banish forgetting.My seed has grown and become prophecy.Truth walks the world above.Magic is risen to the world once more.In Cornwall, they have seen it rise: in an angel of death and endless, unseasonal snow.Across the ocean, on a remote Canadian island, the blood and offerings and smoke of England seem nothing more than distant rumours of hysteria.Until the girl disappears. And the whale comes. And The Plague spreads.And nothing is as it was before. The sequel to 2012’s Advent, Anarchy continues in much the same way, delivering a brooding and unsettling portrayal of life in which magic and domesticity converge. We’re introduced to the far reaches of Canada, in which Officer Goose, of the Mounted Police, encounters increasingly mysterious occurrences after a girl in her custody inexplicably disappears from her cell – and the horrific trek across England that Iz makes in search of Gawain, who doesn’t make an appearance until the very end. In light of this, Anarchy is perhaps too similar to Advent, re-establishing the mystery and intrigue rather than furthering Gawain’s journey and moving forwards on the path to revelation. I remain, even several weeks after finishing the book, uncertain of its necessity to the story: and I am inclined to argue that large chunks aren’t quite as important as their page-time makes out to be – though that might change with the publication of the third and final novel, which (I hope) will make all things clear – and reveal the “bigger picture”! That said, for those with the patience, Anarchy does deliver some fantastic characters. Goose’s narrative, notably, is one of the more interesting narratives told, though that of Iz and Marina also stands out once they finally meet. It’s only when James Treadwell’s characters are on their own and there is a serious lack of dialogue that it gets ever so slightly dull; the character interactions really are the most impressive part of the novel, perfectly conveying his character’s thoughts and intentions. Treadwell’s mastery of language remains in Anarchy, and his prose perfectly conveys the collision of the domestic and the unnatural, but even this cannot salvage the lack of any revelation to truly further our understanding of the mysterious happenings. Sadly, this means that Anarchy feels like a repetition of Advent rather than an advancement of Treadwell’s story. 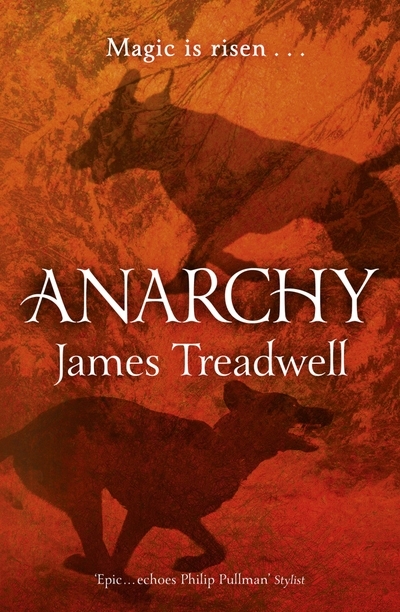 For those with the patience to overlook this, Treadwell delivers and intriguing and mysterious and fantasy sequel, but for those without, Anarchy doesn’t quite shine like its predecessor. What did you think about Anarchy?